Zen — Laidback — Versatile space on two Floors. Home on pretty, tree-lined cul de sac with lush green front and backyard. 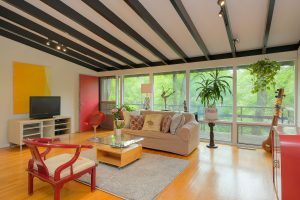 Leafy green views from every window of this lovingly maintained, mid-century modern home with attached garage. Updated amenities with warranties, brand new high-efficiency central heat/cooling system and thermostat with wifi capability, ready to move in 3 bedroom, 3 full bathroom with bonus room used as office/guest room, spacious storage room and laundry room. Features include exposed brick walls, fireplace, hardwood floors, stainless steel appliances, walk in Cedar closet on first floor, cathedral ceilings, and floor to ceiling windows in a spacious light-filled living/dining room. Walkout to patios from kitchen and dining room. Front Balcony overlooks mature plantings in nature garden and birdbath/bird-feed that attracts year round visitors. Easy commute to NYC on scenic Hudson Line and access to hiking trails, fine dining, highways and shopping. Listed by Elizabeth Obih-Frank. 914-591-5600.